First, I must apologize for our recent absence from posting. LG and I have run into a number of more important things, and until blogging starts paying us, I’m afraid we must split our pursuits. Thank you to our loyal readers for your support. Today I review a golf course that I really like–for whatever reason, I’m not sure–Bradshaw Farm. Located in Woodstock, GA, Bradshaw farm is a 27-hole golf course with a really nice layout (at least, part of it; we’ll discuss later). The course is nestled over and around rolling hills and plays down into a valley for part of it. The bentgrass greens are typically in OK shape, although they were a little torn up on my most recent visit. With an abundance of water and a number of different hole shapes, the course has an interesting feel to it. At first drive into the parking lot, the most obvious feature of the golf course is the bright red barn that is used for the clubhouse. Although the course has feelings of a once-private conversion to public, I cannot recall the course ever being private. 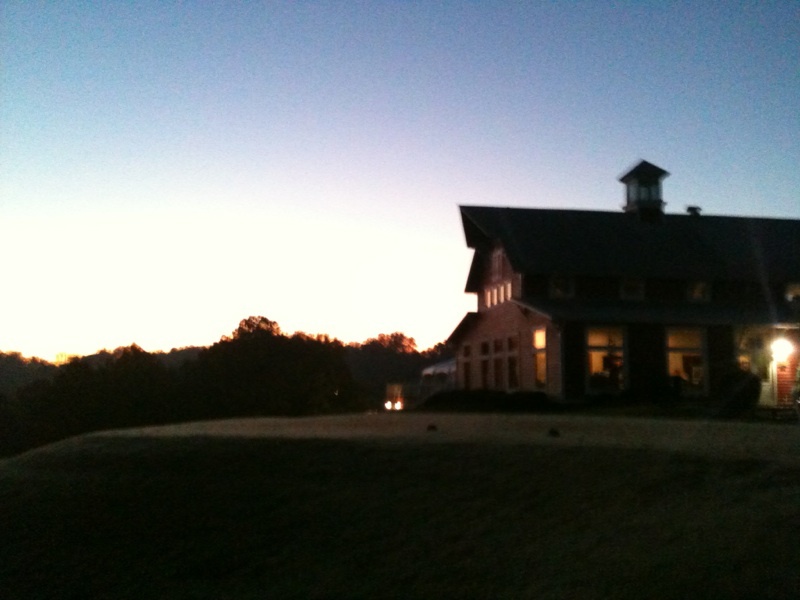 Bradshaw Farm is currently run by American Golf Corporation, who I have previously commented on in https://thepowerfade.wordpress.com/2011/09/20/course-review-trophy-club-of-atlanta-alpharetta-ga/. As such, my expectations for this course are never very high. However, when I go, I am usually surprised by how interesting I find the layout to be. As seen in the scorecard below, none of the three nines is over 3,500 yards from the tips. The course feels shorter than that as well, as playing down major slopes gives the feeling that the player can hit the ball a long way. Many tee shots are hit through a shoot over trees that opens into a fairway. The bunkering is well-placed not only to push the player in the correct direction, but also, many of the bunkers will save players from losing a ball, providing a less-penal alternative to a lost-ball penalty or a hazard drop. The course has several “blind” shots, but it is usually clear which direction you must hit the ball. I rarely feel as though a shot is unfair or that I have no options. My tee time was the first of the day. 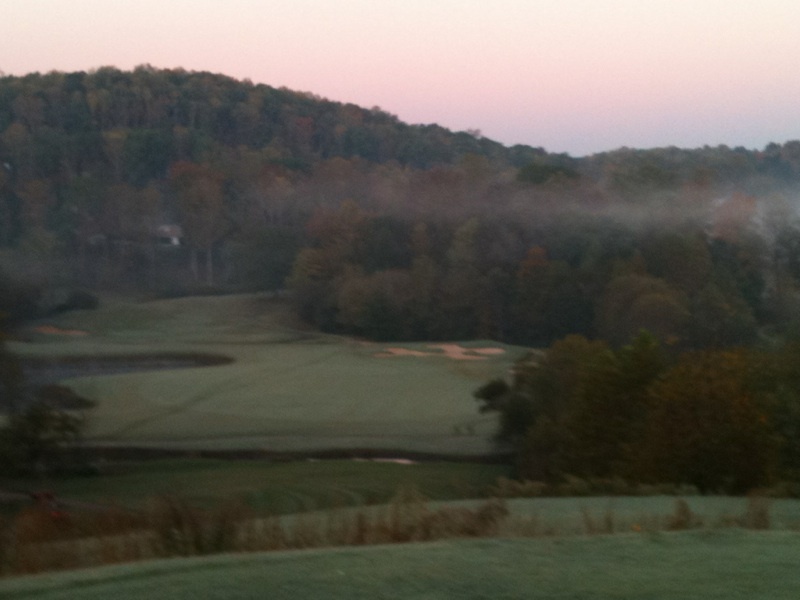 In the photos below, the eerie mist that seems to cover the Georgia mountains in the morning looms over the course. 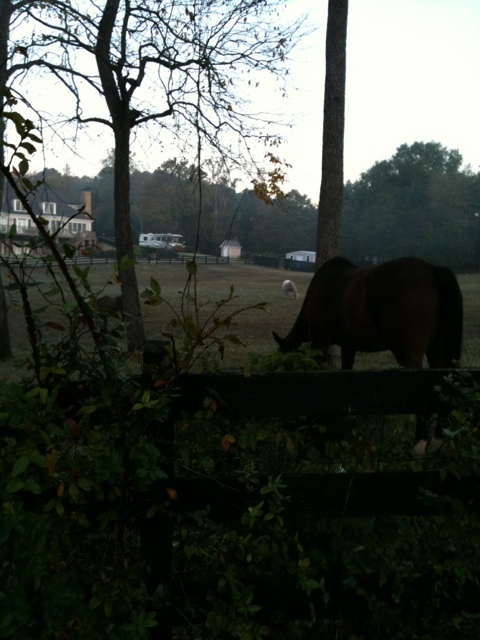 The course provides an excellent opportunity to see some of the beautiful country of northern Georgia, including a horse-farm that touches two holes. The original course had only 18 holes, which are currently the “red” and “white” nines. The “blue” nine was added later. In my opinion, the red and white nines are clearly superior to the blue. 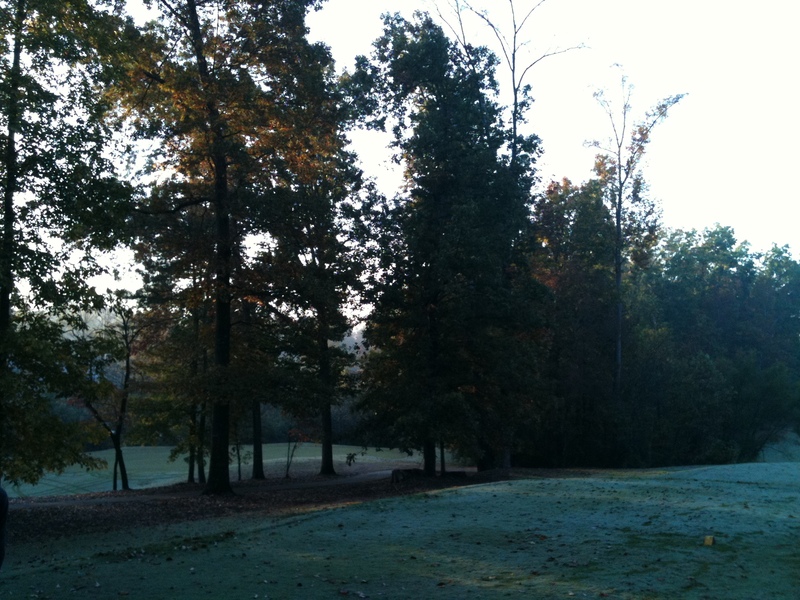 The red–one of my favorite tracks in all of Georgia–starts off with a daunting 70-foot drop to a bunkered fairway followed by a shot over a creek to the green. The following holes play up, down, and around large slopes in the fairways and provide many interesting looks at greens (the photo above of the red barn is the 9th hole of the red nine). The white nine retains some of the character that the red nine has, but it is much more flat. 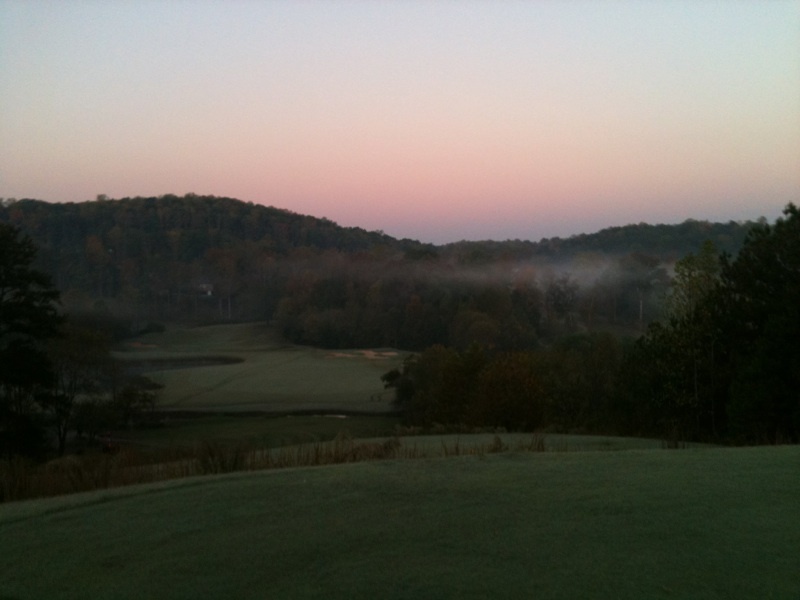 The photos below show the first tee of the white nine. As this tee shot plays into a valley, the remaining holes have little elevation change. The blue nine is a strange and poorly-laid out nine. The holes are essentially flat and have many places where even a shot in the fairway leaves a blocked approach. The blue nine can allow a player to hit good shots without scoring and hit bad shots while scoring. Altogether, it plays similarly to the other two nines but lacks the character of a well-planned golf course. As for the drawbacks, Bradshaw Farm’s first knock is that it is run by American Golf. Perhaps in association with that, the course closes one of the three nines every day, and unless you call ahead you cannot tell which one will be. Although typically the course plays red to white, white to blue, blue to red, that has been changed in the recent trips I’ve had to the course. Also, for my trip at the beginning of the summer, the greens were well-maintained, quick, and receptive. At my most recent trip, they were sandy, spotty, and slow. This inconsistency makes me wonder what I will be getting on each trip and generally makes me not want to drive 45-minutes to an hour away on the off chance that the course will be in bad shape. At $40 or so on a weekday, it’s a toss-up as to whether I’ll return regularly.